Contact Anna for more information and a no obligation interview. 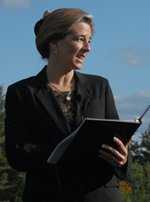 Massachusetts Wedding Officiant and Wedding Celebrant Anna Bacall is a graduate of the Celebrant Foundation and Institute. Educated in the history of faiths, traditions and unity rituals from around the world, Anna is a trained, professional wedding officiant. She creates and performs personalized ceremonies that honor the milestones in one’s life such as Weddings, Anniversaries, Baby Blessings and Memorials. This is an incredibly exciting time in your life. You are creating the setting for the wedding ceremony that will symbolize the beginning of your life’s journey together. This is your memory in the making. You’ll want your ceremony to be unique and personal, a reflection of you, as a couple. As your Wedding Celebrant, I will create with you a one of a kind ceremony customized to mirror your individual beliefs, traditions, faiths, and cultures. We will create a memory you will look back on and relive time and time again.